Speed – Our streamlined domestic network ensures the fastest delivery of documents and packages. Reliability – OCS maintains a secure, in-house information management system with secure back-up facilities, which ensures that your data is always safe with us. Economical rates – All our rates are reasonable, from confidential business documents to parcels containing fragile items of any size. Simplicity – One telephone call and the job is done. You are assured that your shipment is safe with us. The 1980’s ushered in an unprecedented boom in international trade which presented OCS a prime growth opportunity. We expanded the range of services, to include, domestic express delivery services, and international express delivery services to all our customers. The growth in internet accessibility worldwide has encouraged OCS to again to extend our services to include E-commerce delivery for all our clients. Our customers range from government offices, multi-national corporations, financial institutions, and trading companies around the world. In short, we provide integrated post office and courier services of any commodities to Malaysia and the rest of world. We have now extended a similar level of service excellence to our domestic courier services for anything from documents to large parcel. You are assured that your shipment of any fragile items will safety arrive in any destination around the world using our international parcel express delivery services. Our experienced customer service professionals are happy to answer any inquires you may have. Please feel free to give OCS a call the next time you wish to send any shipment. Once in our hands, you are worry-free. We provide instant tracking for all shipments and courier rates on our website (). We provide a one-stop, hassle-free door to door courier services for any document and parcel shipments of any size within a day domestically. We provide seamless IATA carnet services, for all types of commercial cargo (Dangerous Goods, document and parcel shipments); seamlessly from custom clearance (import and export declarations) to delivery completion. OCS provides logistics and trucking service in Singapore and Malaysia. 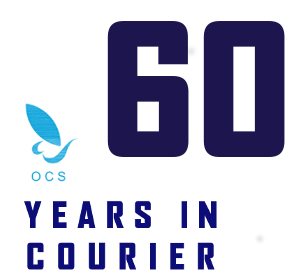 From 1959-2016, our then Overseas Courier Service (OCS) Head Office was located in Shibaura, Minato-ku, Tokyo, Japan. OCS was established by a consortium of major Japanese newspaper publishers including, The Asahi Shimbun, The Nikon Kansai Shimbun, the Yomiuri Shimbun, the Mainichi Shimbun. Since then OCS Tokyo has been the exclusive and sole wholesale distributors of these esteemed publications. In addition, it also provided highly reliable subscription and delivery services for other Japanese printed matter (books, magazines and periodicals).